The Platypus Gravityworks Water Filter is a convenient, high capacity water filtration system that takes the effort out of securing potable water. Simple to use and easy to maintain, this system is capable of providing clean water for you, your family, pets, neighbors, and anyone else that happens by! 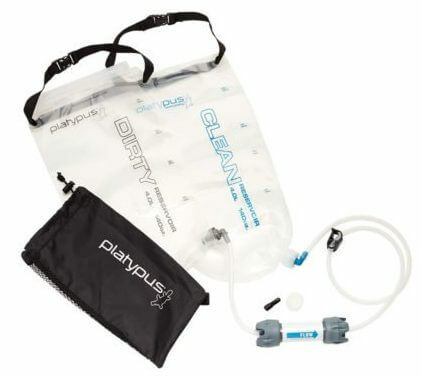 Who Should be Interested in the Platypus GravityWorks Water Filtration System? Filters water while you do other things. The best filter option for large groups of people. More expensive than other types of filters. Filling the bag in areas with little water is difficult. The filter element is fragile. The Platypus GravityWorks is one of the best filters for a group. For just one person, I would choose a smaller option but for a group this filter is king. If you are a scout leader or frequently hunt in off-grid locations with a group of buddies, a filter like this really takes the effort out of providing water for everyone. Around the home, this filter could provide enough clean water for drinking, cooking, and any other task for a whole family with just minutes of work a day. The .2-micron pore size of this filter is pretty much standard and meets with CDC and World Health regulations on removing bacteria and protozoa. Like most filters on the market, this does little to help with viruses or chemicals in water. As long as you choose your source wisely, this filter should do everything you need on the North American continent. 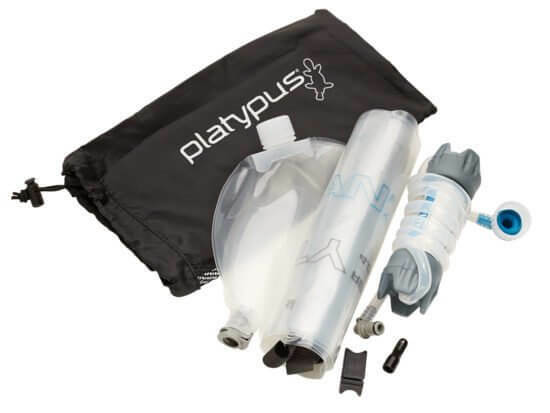 Boasting a 1500 liter treatment capacity, the Platypus GravityWorks has a solid lifespan and with a flow rate of around half a gallon a minute and a bit over a gallon at a time using the included reservoir, this filter is sure to keep you in water with little effort. A well-designed plumbing system really takes a lot of the thought out of getting the filter set up. The reservoir has an automatic valve that only allows water to flow when the system is connected so no need to drag everything along when going to fill up. A hose clamp on the outgoing line allows some flexibility in how water is dispensed. Field maintenance and cleaning of any piece of gear should be a foremost consideration. The Platypus GravityWorks make this a breeze with probably the easiest cleaning solution of any filter type and can be done in seconds. Even checking to make sure the filter is in proper working order is foolproof, quick, and reliable! If you’re not sure how to choose the best water filter for you, read How to Choose the Best Survival Water Filtration System for more info. The point where Platypus Gravityworks Water Filter really shines is in its ease of use and hands-free filtration. The dirty water reservoir has a Ziploc type closure, making filling it a snap as long as your water supply is large enough to get the bag mostly submerged. Simply hang it in a tree above the clean reservoir and let the filter get on with its business while you tend to other matters. A couple of minutes later, you have a gallon of clean water. For groups of people, no other filter type will stack up to the Platypus GravityWorks gravity filter. Like any tool, maintenance is the lifeblood of a filter system. Cleaning is a chore, especially in the field. Except for the Platypus GravityWorks. For most filters back flowing requires getting clean water and forcing it back through the filter under pressure. For the Platypus GravityWorks, simply reverse the flow by putting the clean reservoir above the dirty reservoir for a few seconds and it’s done. This can even be done in the middle of filtering your drinking water. Clever plumbing makes water procurement easy. There are even accessories like a hydration pack that hooks directly into the system for maximum convenience. A bonus feature of this particular style of filter is that it could easily be set up as a shower or sink to sort out any hygiene issues. Though you get a lot of convenience with this filter, it does come at a price. Ranging in the $120.00 area, the Platypus GravityWorks is one of the pricier filters on the market. Couple that with any add-on accessories you might want and you can really spend some money on this setup. For backpacking or a bug out bag, this isn’t the smallest filter with its two individual gallon sized bags, filter, and plastic tubing. However, only weighs about 12oz which is quite a manageable weight for a filter system. If you are in an arid or dry climate filling the bag can be a pain, often coming down to dipping water into the bag with whatever is at hand. In these conditions, a pump style filter is really a better option. The worst flaw of this filter that I see is its fragility. It doesn’t deal well with being dropped or banged around. The filter must be kept dry in cold conditions where freezing temperatures will ruin the filter media and compromise any water you treat with it. That said, checking the filter to make sure it’s safe is very easy. Simply blow back through the filter. If you see bubbles in the reservoir, the system is broken and will need to be replaced. New filter cartridges are sold independently of the rest of the system for around $50.00 bucks. Though the Platypus Gravityworks Water Filter may be expensive and its durability may leave a bit to be desired, I still think this is one of the best filters on the market. This is especially true in a situation where you can leave the filter in place at a base camp or home and not pack it around with you. It offers adequate treatment of contaminants, decent lifespan, and great flow rates coupled with easy maintenance and clever design features that make it a leader in the gravity filter market. If you go solo this filter may be a bit much but for a family or group, this should be the go-to option. Did you find this Platypus GravityWorks review helpful? Please let us know below. Looking for more survival and prepping gear articles? You can find more on our gear page. The Platypus GravityWorks water filter is the best option for a group looking for a light filter that can handle a large amount of water all at once.